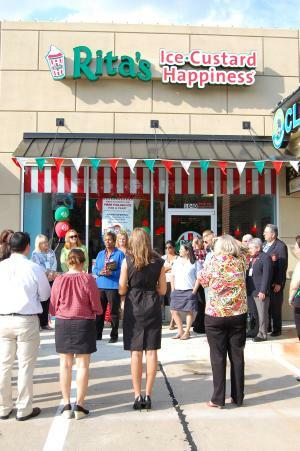 Gina and I attended the Plano Chamber of Commerce Ribbon Cutting for Rita’s Ice Custard Happiness in Plano yesterday afternoon. Located at the northeast corner of Independence and Legacy, Rita’s offers traditional custard and Italian ices in numerous flavors. We tried samples of both and they were delicious! For more information visit their website at www.RitasWestPlano.com or call Rita’s at 972-312-9640.